Among the practices that are described below, if you want some of them, which are not included in the program, to be taught, please visit the Forum, section Practices. When at least five people will have agreed on a date, depending on his availability ,Lama Tsultrim may give the teaching, when there are no group retreats scheduled. Although we're not aware of it, we have accumulated in the stream of our mind since beginningless time an unimaginable amount of negative actions and obscurations. Our mind stream is completely filled with them, and without purification, it is not possible to progress towards enlightenment. Vajrasattva Practice, performed with great sincerity and without distraction, will lead to this purification. 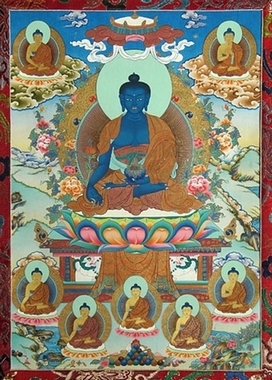 Vajrasattva is an aspect of the Buddha, which expresses the fundamental purity of enlightenment and implements its power of purification ; thus, a great spiritual influence is it related to this practice. 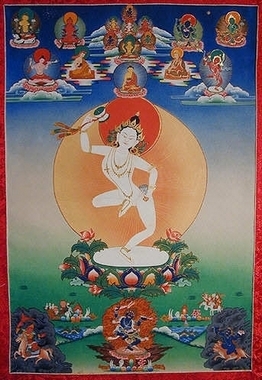 To bring purification through the practice, the combination of several elements is necessary, which are the spiritual influence of Vajrasattva, the power of his Mantra and the qualities of our practice. The essence of our mind is emptiness: it has neither shape nor color nor any characteristic whatsoever, and the negative trends, thoughts and emotions that are in the mind, are also empty, invisible, without form or color; yet they are present and have the ability to harm us. They exist as multiple interrelated factors that delude our minds. In order to purify them, the Vajrasattva Practice uses other interrelated factors that are aspects of meditation which allows the purification. 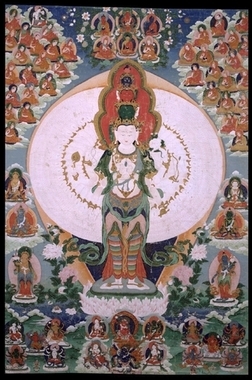 In practice, the purification is made possible by four forces: regretting previous negative actions, the support consisting of the various commitments that have been made, the antidote consisting of visualization and recitations of the meditation itself, and to be determined not to repeat negative actions. Together, these forces allow complete purification, whatever negative actions we have perpetrated. People nowadays, admit that meditation is a good thing, but the recitation of the Mantra often seems strange. If the mind is the most important, it is not alone, because we are generally composed of a body, speech and mind and it is important to implement these components: meditate with the mind, recite the word the Mantra, and keep proper posture with the body. Reciting the Mantra without distraction is important because it has a special power over the mind. In fact, the Mantra is empty sound, interrelated factors and co-emergence. Moreover, obscurations and negative trends that need to be purified are also interrelated factors and they are empty of self-nature, which is why their purification is possible. The interaction of the aspects of interrelated factors, of the Mantra and of negative trends dissolves it-self and operates purification. Thus the practice can have a real cleansing effect. Really understanding the interrelated factors and emptiness is getting closer to enlightenment, and it is not by not understanding this that we wander in the cycle. The most important is that the mind be truly present while reciting. Practices called ‘Union to the Master’ enable to receive the grace that opens up to the realization of the Great Seal, which consists in the realization of the nature of the mind. 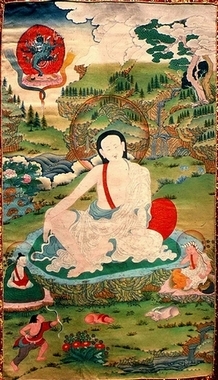 Milarepa is a master who attained enlightenment in one body and one life. He was very famous in Tibet and around the world today. It is preferable before performing such a practice to have completed the preliminary practices, or at least to have started these practices. The Buddha Amitabha is a major aspect among the meditation practices to develop love and compassion. All the practitioners of the Buddha’s teachings regularly pray Amitabha. The practice enables to realize the nature of mind and to be reborn in the Pure Land of Bliss. The Land of Bliss is a pure manifestation of the Sambogakhaya, which appeared through the power of the wishes of the Buddha Amitabha. It is easily accessible to those who develop a deep trust in Amitabha and his Pure Land. To be born in this Pure Land means that you have realized the nature of mind and are free from being compelled to be born again in the cycle of existences. You will make rapid progress through the Land and Paths of enlightenment, and then, at last, you will be able to help beings in infinite number and for this purpose, you will be able to display in the cycle without the drawbacks and sufferings, because self-grasping has been defeated. If you wish to pursue further this practice, before, you usually need to receive the Empowerment from a great Lama as Karmapa or as Shamarpa. The transmission through ritual reading, explanations and comments are given on site during the retreat. This practice is based on a Terma ritual (Hidden Treasure) practiced according to the Kriya Tantra (Transmission Current of Behavior), the Tcharya Tantra (Transmission Current of Action) and Tantra Yoga (Transmission Current of Union ), which is read at each session. This practice includes the recitation of praise and mantras (Sacred Words) with visualizations. The Liberatrice is the female representation of the Enlightenment. She is the mother of all Buddhas (Enlightened beings). She represents wisdom itself. This practice helps to open up very quickly to Enlightenment, if we develop faith and trust in this symbol, which is brought alive. 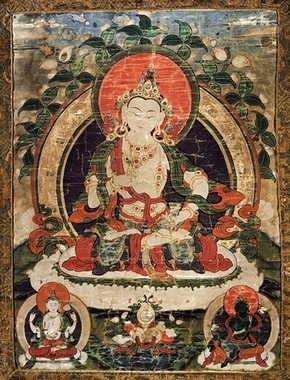 The practice of the Enlightened Sage of Medicine (Sanggye Menla) is based on a Terma ritual (Hidden Treasure) of the Anoutara Tantra (Transmission Current of Unsurpassable Union), from the fourth class of Tantra, of the ancient tradition that is read at each session. This includes the recitation of praise and mantras (Sacred Words) with visualizations. 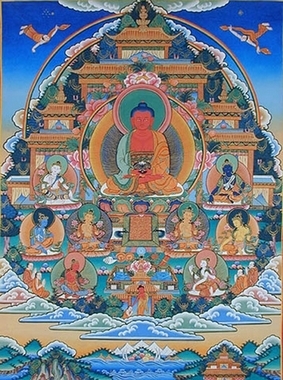 The Buddha of Medicine is a male representation of Enlightenment. He gathers the wisdom of all Buddhas (Enlightened beings). This practice, on the relative level, enables you to be cured from all physical and mental ailments, and ultimately to achieve Enlightenment rapidly, if you develop faith and trust in this symbol, which is brought alive, as for all practices in the Diamond Vehicle (Vajrayana). As a preliminary, we will accumulate the recitation of one hundred thousand Mantras (Sacred Words) of the Buddha Amitabha (enlightened Sage of Infinite Light), as it is the central aspect of this practice. Known in Tibet as a practice that enables enlightenment without meditating, you just need to be trained and be proficient. That way, at the time of death, when signs of elements dissolution occur, you are able to transfer your conscious principle in the Dharmakaya (Body of Truth), which is the ultimate achievement. Thus, with this practice, we can achieve enlightenment from the very moment of our death without having to undergo the interruption of a new birth. 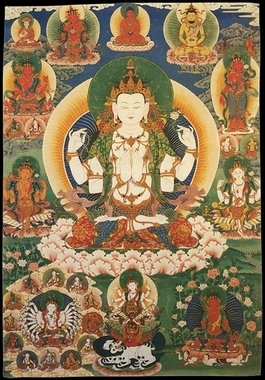 The meditation on the deity and of hisMantra enable deep meditative absorption by developing the pure vision of ourselves, of all beings, of our environment, in terms of appearance and sounds, and in terms of mind by transforming all dualistic grasping and all attachment to the grasp of reality. This practice of the Great Vehicle (Mahayana) is associated with the practices of Transmission Currents (Tantra). This practice which seems complicated, includes the basic principles of mind training (Lojong). It is particularly powerful to cut the self-attachment that is the cause of all our suffering. 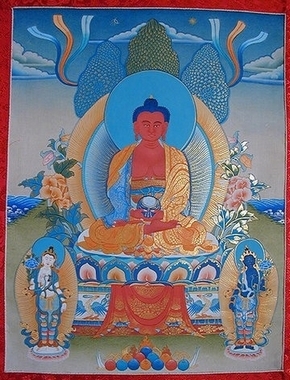 The practice is mainly based on the development of love and compassion through the pure support of meditation which is the manifestation of one thousand arms Chenrezig. The practice consists on a first day of partial fast and on a second day of strict fast with ethic vows. Do not sit in luxurious seats or on not suitable seats (so as not to develop pride). For Nye Ne and Nyung Ne the vows are the same. For Nye ne we can eat and drink at the authorized times, and we can talk moderately in a meaningful way. On the day of Nyung Ne we do not drink, do not eat and do not speak. We usually respect the vows of Nye Ne on the first day and the vows of Nyung Ne on the second day. By the way we make these vows and turn our mind in practice, we develop the altruistic mind of enlightenment; that is why this practice is part of the practice of the Great Vehicle (Mahayana). 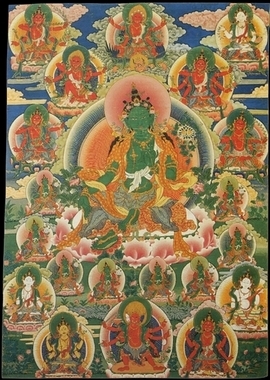 Through meditation on love and compassion shown by the appearance of eleven faces and a thousand arms Chenrezig and reciting his mantra, we also practice the vehicle of Secret Mantra, called Vadrayana as well. Thus, it is taught that if we practise perfectly Nyung Ne, we become an owner of the three kinds of vows. We practice the ritual of eleven faces Chenrezig three times a day. A Nyung Ne takes place over a couple of days: the first day we have a simple rice soup in the morning at 7 o’clock and at noon we eat an exclusively vegetarian meal. During the breaks we can refresh with drinks. On the second day, we do not eat or drink or talk until the following morning at the time of rice soup. A Nyung Ne ends at 9 AM on the third day. Required prayer texts: Namjompa practice, Prayers to the Buddha, Nyung Ne ritual, the Treasury of Wishing Prayers, Nyung Ne attached prayers. Sometimes we say the long prayer to take birth in the Pure Land of Great Bliss or we read the practice of the Medecine Buddha. The French texts are available on site. Refuge: Engagement on the path to enlightenment with altruistic motivation, going under the protection of the three ‘rare and sublime’ that we also name the ‘three jewels’, that is what we call taking refuge. In the Vajrayana as in other schools in the Buddha’ Teaching, we are under his protection, which represents the perfect Enlightenment. We take refuge in the Dharma, which is the teaching, the path to Enlightenment and in the Sangha, the community of Enlightened beings who are guides that enable us to follow the path without any error. Furthermore we also are under the protection of the three roots that are Lamas, Root and of the Lineage, Ydams, which are aspects of the Buddha and the Teachings Protectors. If you have never taken refuge, it would be better to do so because it is preferable to have these vows if you want to start a Vajrayana practice such as Nyung Ne. The exceptional value of such a retreat is beyond any explanation and imagination. The resulting benefits are immeasurable. That is why it is especially wonderful to join it. It is possible to join us for the duration of your choice. The practice of eight Nyung Ne is extremely beneficial. It is said by the Buddha that it closes the door of rebirth in the six classes of beings and enables to reborn in the Pure Land of Bliss (Déouatchèn). Even if you can only do one Nyung Ne, it is also excellent. It is taught that practicing one Noung Ne closes the door of rebirth in the lower worlds where there is only suffering. All this is taught to understand the breadth and depth beyond any measure of the benefits included in this practice. If your stay lats more than 15 days, a reduction of 2 € par day is granted.